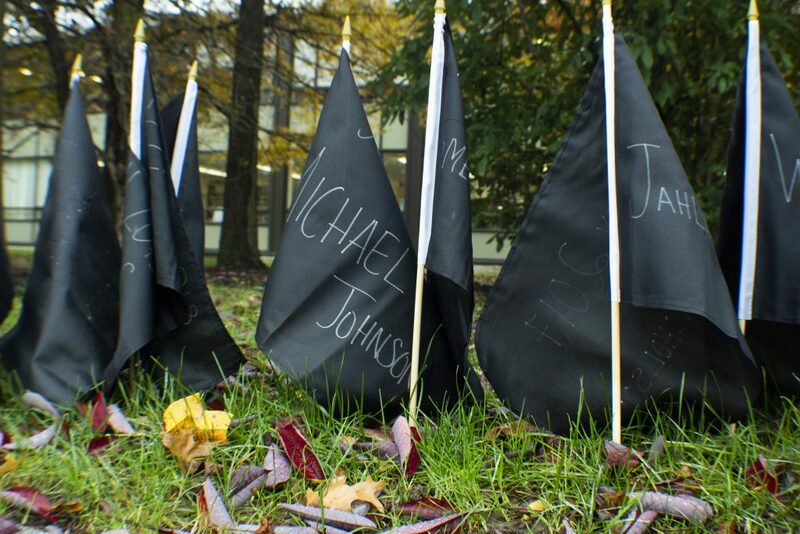 Romel Adams/Photography Editor Black flags with the names of Black individuals killed by police or in police custody lined the Spine on Oct. 5 in recognition of Black Solidarity Day. Black Solidarity Day is a memorial day created in 1969 by Carlos E. Russell, a Black Panamanian-born Brooklyn activist who died in July 2018. He was a professor and chair of field studies at SUNY Old Westbury, director of international and urban affairs at Medgar Evers College and dean of contemporary studies at Brooklyn College, among other contributions. Russell was inspired by Douglas Turner Ward’s play, “Day of Absence,” where the entire Black population in a small southern town disappears one day, crippling their society and sending the town into chaos. This is due to the fact that, during the time period in which the play is based, Black people were subjected to occupational segregation and were only allowed to hold positions in menial lines of work, which were essentially at the framework of their society. In this admiration, Russell created Black Solidarity Day as a means of recognizing and showcasing the economic power of the Black peoples. Held annually on the Monday before Election Day, Black Solidarity Day encourages those affected by the African diaspora to abstain from participating in any commercial activity as a means of highlighting not only our economic power, but also to shine light on racial inequalities and the wealth gap between the wealthiest people within our nation and those stuck in the cycle of poverty. At the Black Student Union’s Black Solidarity Day Festival on Nov. 5, the theme of unity was apparent due to not only the presence of all the Black organizations on campus, but also the responses given to the question, “Why is Black Solidarity Day important? And why is it important for those affected by the diaspora to unify?” Most answers were geared toward unification for political fortification. In our unification, we are able to acknowledge and address the different needs of individual groups within our community. If we come together, we will be able to bring about the change necessary to end the cycle of marginalization, discrimination and the criminalization of our blackness, which have cost us many lives.